'Even Cromwell couldn't breach Clonmel... but a woman could," quipped a local man of the devastation wrought by Hurricane Ophelia. The south Tipperary town was ruefully counting the losses incurred. The storm had played no favourites - wreaking havoc across the board. The day before, the Moyle Rovers minor footballers had been celebrating a county championship final win against Galtee Rovers at Semple Stadium. Less than 24 hours later, the Tipperary GAA club was left on its knees - the roof ripped off their clubhouse outside Clonmel. It could take two months before things are back up and running again, said club chairman John Owens. "This is a huge setback for us," he said. Built in 2008 at the cost of €2.2m thanks to community efforts and Lotto draws, the club had been the jewel of the community, used by 11,000 people throughout the year. "Frighteningly strong" winds on Monday put paid to all that for now, as the aluminium roof sheets tore off and lifted into the air, while rain seeping into the building warped the wooden floor. "We were very lucky nobody got hurt because even if they were walking the fields, they could have been killed," said Mr Owens. Last night, a massive clean up operation was under way at Moyle Rovers as the community rallied around to do what they could. It was a woefully similar tale of devastating roof damage at St Oliver's Community Centre, operated by the Waterford and South Tipperary Community Youth Service at Elm Park in the town. Local man Joey Pyne said he had watched the first steel panel lift off the roof and hurtle to the ground, knocking a neighbour's back wall, scattering the breeze blocks. "I thought it was a pole at first," he said, saying the winds had been unlike anything he had ever seen before. Inside the community centre, used daily by around 60 local youngsters aged 10-22, was a sorry sight. Half the roof gaped open in the games room, where snooker and football tables had been pushed aside. Downstairs was worse, with a massive section of the roof in the large activity room gone. The Youth Service is now looking for temporary accommodation. In the centre of the town, scaffolding had been erected around Curtains - the curtain and blind shop on O'Connell Street - which had also lost a roof. The town's Lidl store - open only "six or seven months" - had also lost a huge section of metal roofing, after the wind had swept in over the hills behind. In Kilsheelan, Gerry Hennebry told of a lucky escape after a large lamppost came crashing down less than three metres from his home. Another identical lamppost also fell about 20 metres away on the green at Jubilee Terrace. The wind had been the worst he had ever heard in his life. "It was frightening," he said. "It was lucky we had all been told to stay inside and that there was nobody out walking because they could have been killed instantly." 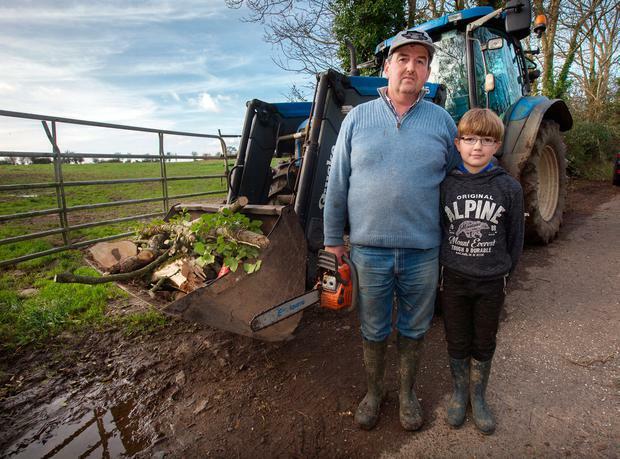 While in Aglish, Co Kilkenny, the storm had come at a sobering cost for farmer Thomas Dermody who lost two four-year-old Friesian dairy cows - electrocuted after a power line had come down in his field. The damage was €2,500, he said. "We'd been told they were safer outside than in barns that might come down - but that wasn't the case here," he said grimly. He had knocked a hole in a ditch to retrieve the other eight cows that had been standing just 40 metres away from the dead livestock. But these weren't the big losses, he said, mindful of the death toll, with Michael Pyke (31) having lost his life not too far away in Cahir. Just up the road, farmer Stephen Wall had been forced up onto a treacherous barn roof in the middle of the storm to secure it after it had collapsed, threatening to send sheets of rusting metal flying into the road. It had been a big operation in high winds, said his wife Debbie. "But it had to be done, he couldn't risk it hurting someone," she said.